My last thought for 2013 is that for their failure to co-operate and coordinate to make the United Nations work to stop the slaughter and destruction in Syria, the leaders of the five permanent and controlling members of the Security Council – the U.S, Britain, France, Russia and China – are war criminals by default. There are only two ways to run this world of ours. One is in accordance with the rule of law and respect for the human and political rights of all people. In this way of managing Planet Earth, the governments of all nations, no exceptions (so including those of Israel and the U.S.), would be called and held to account by the Security Council and punished as necessary and appropriate when they demonstrated contempt for the rule of law and their various treaty obligations and other commitments. The other way is in accordance with Jungle Law. For some years it has been my view that our leaders are taking us back to the jungle. 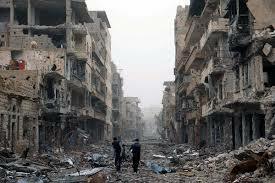 What has been allowed to happen in Syria has only reinforced my fear on this account. From the moment in April 2011 when the Syrian army was deployed to quell the uprising and fired on demonstrators across the country, it ought to have been obvious (I’m sure it was) to the governments of the major powers that the minority Alawite standard bearers, President Bashar al-Assad and his top military and other security people, would kill and kill and kill to stay in power and, if necessary, would die fighting rather than let go the levers of their power. In my analysis the real tragedy is that something could have been done at a very early stage to stop the killing and destruction. What was needed was for President Obama to have a private conversation with President Putin along something like the following lines. If Obama had been wise enough to take such an initiative, I think it much more likely than not that he would have got a positive response from Putin. Next post: Israel-Palestine: Is Peace Possible On Obama’s Watch?